Asset Tracker for Jira is a powerful, web-based asset management platform designed by Spartez to help companies of all sizes with tracking and visibility of inventory. The software eliminates IT helpdesk inefficiencies and allows companies to unlock the full potential of their employees with a comprehensive, customizable, and scalable configuration management database (CMDB) solution for their IT Service Management (ITSM) needs. It empowers teams to map the underlying helpdesk and asset management procedures and link assets automatically to incidents, people, and service requests. The application allows businesses to scan network through a Windows Management Instrumentation (WMI) and create links between users, assets, and Jira issues. Users can leverage the built-in query language and modified JQL functions to search for assets and bring them together into hierarchies. Asset Tracker for Jira is a reliable solution that streamlines the management of resources, assets, and inventory. It is a powerful software that allows companies to organize assets to get a clear view of what they have, where they have it, and who is using it. The platform facilitates rationalized ITAM directly from the service desk allowing users to manage operations and assets anywhere, anytime. The application has a robust search results feature that utilizes a built-in, custom query language and JQL plugins to search for assets in your network. The feature comes with user synchronization, customized asset properties, and upgraded printing tools. These tools keep the Jira assets database up-to-date while making it helpful in multiple ways involving Jira users, Jira issues, and assets. 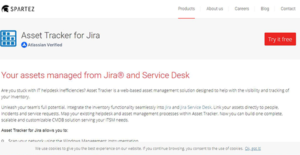 Asset Tracker for Jira allows you to set up your inventory fast. It enables you to organize the rotation and ownership of physical IT assets, and other equipment’s in your company. The predefined actions make it easy to seamlessly check-in/checkout assets including audio/visual tools & gear as well as mobile devices. Better still, Asset Tracker for Jira permits you to set up Jira and service desk issues and link them directly from My Asset view or your dashboard. The solution lets you build an efficient IT assistance process and link it directly to your database for faster issue resolution. Also, with the dedicated mobile apps for IOS and Android, you can easily run automated operations and inventory check for the assets on the go. The WMI based network scanner and import features expedite the setup process allowing you to fashion a modern CMDB system in no time. If you are considering Asset Tracker for Jira it might also be sensible to examine other subcategories of Best IT Asset Management Software listed in our base of B2B software reviews. Every enterprise has its own characteristics, and might require a specific IT Asset Management Software solution that will be designed for their business size, type of customers and staff and even individual industry they support. You should not count on locating an ideal software that will work for each company regardless of their history is. It may be a good idea to read a few Asset Tracker for Jira reviews first and even then you should pay attention to what the software is supposed to do for your company and your staff. Do you require an easy and intuitive app with only elementary functions? Will you actually use the complex tools needed by pros and large enterprises? Are there any particular features that are especially beneficial for the industry you work in? If you ask yourself these questions it is going to be much easier to find a solid software that will fit your budget. How Much Does Asset Tracker for Jira Cost? Asset Tracker for Jira enterprise pricing information is not availed to the public. Contac Spartez for a detailed pricing structure. We realize that when you make a decision to buy IT Asset Management Software it’s important not only to see how experts evaluate it in their reviews, but also to find out if the real people and companies that buy it are actually satisfied with the product. That’s why we’ve created our behavior-based Customer Satisfaction Algorithm™ that gathers customer reviews, comments and Asset Tracker for Jira reviews across a wide range of social media sites. The data is then presented in an easy to digest form showing how many people had positive and negative experience with Asset Tracker for Jira. With that information at hand you should be equipped to make an informed buying decision that you won’t regret. What are Asset Tracker for Jira pricing details? What integrations are available for Asset Tracker for Jira? If you need more information about Asset Tracker for Jira or you simply have a question let us know what you need and we’ll forward your request directly to the vendor.